People may arrive at my office because it was recommended by a friend, or often it’s a last resort for pain that they’ve had for some time. Ironically, no matter what I see my patients for, the number one report that people give is that they feel more relaxed after a session. What started as anxiety or fear of the unknown, turned into a realization that they found something that could give them the tools to improve their health and speed recovery from injury. We can use this concept to relate to any obstacle where the solution seems too daunting a task, but just being open to the experience may have a life-changing benefit. When I first starting getting acupuncture, I was happy getting relief of the physical complaints for which I was seeking treatment. However, the greatest benefit I derived was the transformation of the mind/body association that had me see my own anxiety, fears and health and give me insight on how to live a more empowered life. To reiterate my personal experience, growing up with a love for competition and getting into running early, I was constantly plagued by pre-race anxiety. Fear of the “unknown” was not knowing how I would do in a race. Would I go out too fast and die, letting down my teammates and underscoring all the hard work in practice that I did to get me to the starting line. Although I could perform well in practices, my anxiety and fear would often limit me in a race and create GI issues that lasted well after the race was over. In our current lives, anxiety and fear come from many sources. 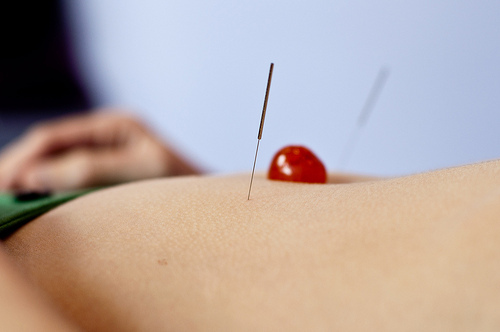 In the acupuncture example, the core of the “needle” anxiety are two main factors. Our limited knowledge in what happens during an acupuncture treatment, and our own personal strategies we have for handling factors we perceive as out of our control. There is still relatively little knowledge on how acupuncture actually works, but we do know it can create systemic and local changes in the body. How do you perceive and adapt to change? Most runners can remember running a race that was longer than they had ever done before. A few years later, after more training and race experience, they may wonder why was the 1st time so hard. Even being out of shape, I can still complete a half marathon. I may get sore after with little training, but my expectations are so much different than when I used to be a sprinter and thought only strange people ran long distance races. Just being “afraid” of acupuncture doesn’t make one an anxious or fearful person. We have enough overstimulation in our environment to do that for us. We drink too much coffee or caffeinated gels, watch PG-13 superhero movies, engage in Internet dating blind dates, and RUN for long distances at fast speeds, which all act to serve oversized portions of elevated heart rates, hyper metabolic states and keep us in the fight or flight, adrenal exhaustion mode for much too long. If our fear and anxiety is a factor in our life, can the thing that many people already are conditioned to fear, NEEDLES, give us relief. Yes, it can! But instead of taking it from me, ask and trust your friends experience instead. Hear what transformation other people went through and it may change your outlook too.